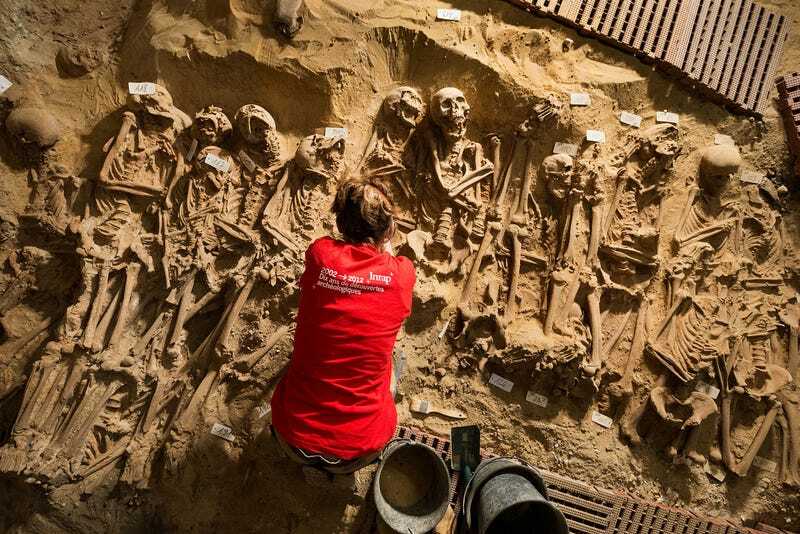 Archaeologists in Paris have found the skeletal remains of 200 individuals laid out neat rows in a communal grave. The site, once the cemetery of a hospital that operated from the 12th to 17th Century, is now a supermarket. The Monoprix Réaumur-Sébastopol supermarket called in archaeologists from the French National Institute for Preventive Archaeological Research (INRAP) to conduct surveys in advance of new construction. Because of the site's history (it's where the Paris Trinity Hospital was located for many years), the archaeologists were, at most, expecting to find scattered remains. But the discovery of so many bodies, all laid out in well-organized graves, came as a complete surprise; they had assumed that most of the corpses were relocated in the 18th century to the Paris Catacombs, a burial site containing some six million people. "What is surprising is that the bodies were not thrown into the graves but placed there with care. The individuals – men, women and children – were placed head to toe no doubt to save space," said archeologist Isabelle Abadie. The bodies appear to have been buried all at the same time, which she said suggested they might have been the victims of the plagues which struck Paris in 14th, 15th and 16th centuries. Carbon dating will be carried out to determine when the mass burial took place. Fragments of medieval ceramics were found among the bones along with pottery dating from more recent times. The bodies will be taken to an INRAP site for inspection and analysis. Once that work is done, the French government will take charge of their final resting place. "Whatever mortality crisis struck — plague, other epidemics, famine — it struck wide," notes the History Blog. "There are adults and children of all ages and both sexes buried in the largest mass grave." Preliminary analysis has not shown signs of disease or injury. The archaeologists will try to extract DNA samples in hopes of revealing the presence of fatal pathogens. Other tests will be performed to determine their relative state of nourishment, or whether they had repetitive strain injuries from hard labor, among other tests.